For a beau-tea-ful person – inside and out! 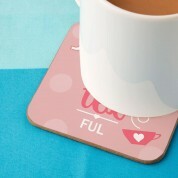 Our novelty coaster will go down a treat with any tea lover. 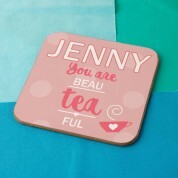 It is pink with polka dots, and reads the recipient's name followed by “you are beau-tea-ful”. 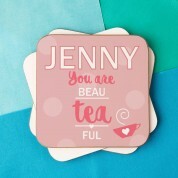 A picture of a tea cup and a love heart complete the design. We think this makes a great gift for a birthday, though it would suit any special occasion. It makes a great stocking filler when on a budget. The recipient will be proud to show off such a complimentary gift! It will brighten up any table and is sure to be a conversation star with whoever sees it. She wont own anything quite like it!